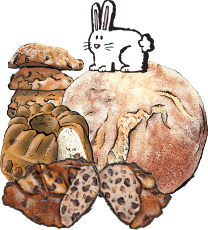 From Zingerman’s Bakehouse, a collection of breads and baked goods good for any of Easter’s meals. The Easter Bread Box includes a loaf of pecan raisin, chocolate sourdough and paesano. The Easter Bakery Box includes paesano and pecan raisin breads, four assorted scones, and our nosher-sized sour cream coffee cake.